All of that - this is my One Word for 2014. And thanks to Melanie I even have a cute little sign that says so! Last year I chose the word CREATE to have before me. 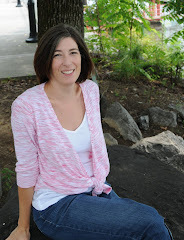 It was my hope that this word would spur me on to more actively participate in my life in ways that were creative: knitting, sewing, crafting, meals, homekeeping, family time.... I have to say, it ways fairly effective. I created much more this past year than I would have without the visual motivation. So this year I choose to live and act with intention, no matter the day, time or circumstance. Will I be 100% successful? No. Will I be more intentional than if I hadn't chosen the word? That's what I'm praying for and counting on. Only time will tell. It's a good sign that I have this post up and will be linking it to others for good measure and accountability. My first two "Intention"al acts were choosing that word and trying to match it to Pantone's Color of the Year - Radiant Orchid. I love purple and this makes me very happy! 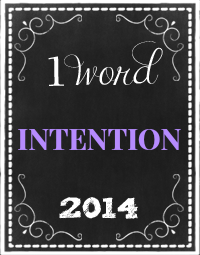 Are you choosing one word for 2014? Would you share it with us here? Add your post link if you'd like. Thanks! Blessings on you all for a 2014 beyond all you could ever ask or imagine! If you are looking for a way to be intentional about your fitness in the new year, I have a Shazzy Fitness DVD giveaway until the end of New Year's Day! You absolutely are original! I read your post, I'm not sure many are coming at it from your perspective!! Love your word, and the color of it! I will not be choosing a One Word focus this year. However, I know the Lord has plans for me. Hope to post about it tonight! Thank you so much, Angie!! I'm interested to see where this journey leads myself! My word this year is Creative. Scary and wonderful at the same time. Create was my word last year and I loved all the ways it could apply and how much I actually thought about it through the year. I'm excited to see what it brings you! God gives me a word during the year - not always January - and it's like a theme He teaches me about. Since July - it's been Communication - all about opening channels of communication with my boys instead of stopping them up. It's morphing into Empowering Communication that sets healthy boundaries. Wishing you blessing - intentional blessing in the new year! Love that!! This word definitely came of of create from last year and a whole new perspective on how I was living. I'd already changed my header line to include it months ago. I love seeing how God changes us and makes us go deeper into His will! Intentional is a great word choice too. I choose that for my secondary, if there ever was a thing. Love ya, friend! Intention is such a great word as it pulls our lives into focus more. I love your word for the year. :) I chose Restore...or, more accurately, God did the choosing. It's a big and scary word for me...but I'm thinking He has some big things to accomplish in my life this year. :) How are ya? Thinking of you today and smiling...thanks for being a blessing!